CMS Administrator Seema Verma last week left no doubt: she​ wants​ to​ give​ states​ the​ keys​ to​ their​ Medicaid​ programs. 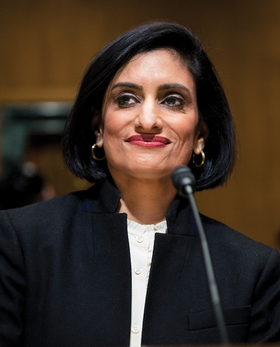 Speaking before the National Association of Medicaid Directors, Verma said the agency will approve efforts by states to adopt conservative ideas such as work requirements for beneficiaries. "These are individuals who are physically capable of being actively engaged in their communities, whether it be through working, volunteering, going to school or obtaining job training. Let me be clear to everyone in this room, we will approve proposals that promote community engagement activities," she said. Leading up to the speech, Medicaid directors were hoping Verma would clearly articulate the administration's approach, especially since several state waiver requests have been languishing at the agency. But change won't come easily. 1. The CMS will undoubtedly face legal challenges to any approved waiver that includes a work requirement. Opponents say such provisions violate the original intent of Medicaid—providing coverage to low-income people. 2. Looking at non-elderly adults without disabilities, 59% of Medicaid enrollees age 19-64 work; 78% are in families with at least one worker, according to the Kaiser Family Foundation. 3. A Health Affairs study found that 11 million people would lose Medicaid coverage if all states adopted work requirements. Despite giving people with disabilities an exemption, many beneficiaries may have physical or mental limitations that prevent them from working but don't qualify them as disabled. 4. The CMS is developing public scorecards to grade state and federal Medicaid outcomes data. 5. The agency will: give states clear timelines for decisions on waiver requests; fast-track routine proposals and renewals; more quickly approve waivers that mirror those from other states; and allow waivers that have proven successful to be extended to 10 years, up from the usual three to five years. Some experts question whether a 10-year waiver is legal since HHS only has authority to approve short-term experiments that maintain the law's original intent.